Sarah L. Klaassen joined the law firm in January 2007, following a judicial clerkship with the Honorable Michael J. Thompson in Kandiyohi County District Court. Sarah earned her undergraduate degree from Hamline University in 2002, and her law degree from William Mitchell College of Law, St. Paul, Minnesota in 2005. 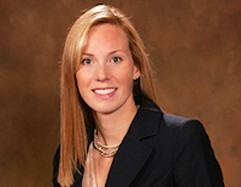 Sarah was admitted to practice law in the State of Minnesota in 2005. She is a member of the Minnesota State Bar Association and the 12th District Bar Association. Sarah serves on the board of the Willmar Area Community Foundation. She received the Volunteer Attorney Award in 2010. Sarah lives in Willmar with her husband, Gabriel, a Willmar native, and their three children. She enjoys spending time with her family, the outdoors, athletics and reading.